Google has been my search engine of choice for most of this decade. Before that, I used Yahoo!. I don't believe I've ever used a Microsoft search engine for non-work purposes. Microsoft has never got search right. They keep trying, bless their little hearts, and every few years we get a Microsoft search re-branding as they launch their latest Google-killer. This time, it's Bing. It's live right now at bing.com. Go ahead and pay a visit while curiosity gets the better of you, it's unlikely you'll ever go back. As Google-killers go, this is pretty underwhelming. If you're one of the 0.35% who used Live.com for searching the web (note: figure completely made up for comedic purposes), I have bad news for you. Bing is the new Live Search, which was the new Windows Live Search, which was the new MSN Search. I'll let you know next month how many visitors came here from Bing. Personally, I preferred the codename Kumo. Microsoft couldn't even get that right. Based on a few quick tests, the results are all over the place and sometimes just plain wrong. For example, a search for "maple leafs facebook" incorrectly links to the Maple Leafs page on facebook. Google of course gets this one right. I just don't think I will ever use the term, "Go Bing it". Google works. Google is good. Why bother going to a new engine? Bing doesn't seem to like me the way Google likes me. I just did a few searches that bring a lot of traffic over here from Google and I'm not ranking very high in Bing. 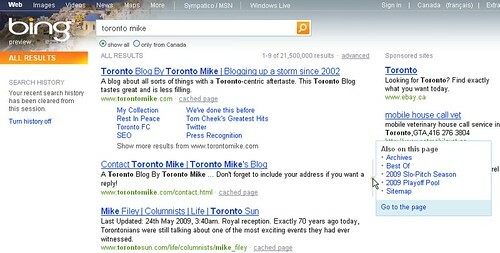 A Google search for toronto blog, for example, has me in the top 3. In Bing, I'm #23... like Air Jordan. I'm glad someone mentioned Cuil. That's the last time I tried a new search engine. I'd been noticing that I was starting to get a few hits from Bing over the last little while. Wow, maybe they're on to something with this I thought. then I checked to see how much I was actually getting from them and I discovered that it's the same 2 people searching for things over and over again. Good job, Microsoft. Then again, it is 2 more people than I've ever gotten from Cuil, so maybe it's not so bad. But yeah, the interface, I hate it. I'm sticking to Google like everybody else is or should be.